Ready to conquer any job. This printer is all about being productive and efficient. The new XXL ink tanks can print approximately 2.5 times more prints, and by having individual tanks, you’ll have to just replace one at a time. Print stunning prints at a maximum 9600 dpi resolution virtually anywhere in your home using the built in Wi-Fi® capabilities. You can even print photos directly from your smartphone. Now with double front paper cassettes, you can load two different sizes of paper at the same time. The high performance individual ink system offers a 5-colour ink system for business-quality text, colourful presentations and documents, as well as beautiful photos. The ChromaLife100+ system combines enhanced FINE print head technology with select genuine Canon photo papers and inks for beautiful borderless photos that will last up to 300 years when stored in an archival-quality photo album. The new larger capacity cassette loads up to 250 sheets of paper. Quiet Mode significantly cuts down on noise and lets you work in peace. 3.0-inch colour viewer gives you a better view on a large display. Dual Function Panel only shows you the keys you need to see for easy to follow operation. Built-in Auto Duplex printing helps save paper. Double front paper cassettes allow you to load two types of paper at the same time. Direct Disc Print prints on printable CDs and DVDs. My Image Garden software refreshes old photos and helps organize scanned photos and documents. Conveniently print pictures from online photo albums as well as download web templates and calendars right to your printer with PIXMA Cloud Link. AirPrint2, Auto Duplex Print, Auto Sheet Feeder, Borderless Printing5, CD/DVD Printing, Dual Function Panel, Document Printing, Full HD Movie Print8, Google Cloud Print3, Photo Printing, Template Print, Evernote. Auto Duplex Document Feeder, AE (Auto Exposure / Intensity) copy, Auto Duplex Copy, Borderless, Fit-to-Page, Gutter Shadow Correction Copy, Image Repeat, Intensity, Multiple Copy: 1-99 pages, Preset Copy, Ratios, Reserve Copy, Sort (ADF), Zoom. Auto Document Fix, Auto Duplex Scan, Auto Scan Mode9, Network Scan, Push Scan, Scan to Memory. Answering Machine Connectivity, Caller Rejection, Check RX Fax Info., Fax Reception Reject, Fax Number Re-Entry, F/T Changing(manual), Group Dialing, Memory Transmission, Redial, Remote Reception. Upper Cassette: 20 Sheets Photo Paper 4" x 6"
Warranty1-year limited warranty with InstantExchange Program. 1-year toll-free technical phone support. 2. Printer firmware update may be necessary for AirPrint function. Certain exceptions may apply. A PC running Windows XP or later or A Mac running OS 10.4.11 or later and USB cable required to perform firmware update. AirPrint functionality requires an iPad, iPhone 3GS or later, or iPod touch 3rd generation or later device running iOS 4.2 or later, and an AirPrint-enabled printer connected to the same network as your iOS device. A printer connected to the USB port of your Mac, PC, AirPort Base Station, or Time Capsule is not supported. 3. Requires an Internet connection. Google Cloud Print Function available April, 2012 or later. 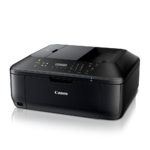 Printer firmware update may be necessary for Google Cloud Print function. Certain exceptions may apply. A PC running Windows XP or later or A Mac running OS 10.4.11 or later and USB cable required to perform firmware update. 4. Resolution may vary based on printer driver setting. Colour ink droplets can be placed with a horizontal pitch of 1/9600 inch at minimum. 5. Envelopes and High Resolution Paper are NOT supported for borderless printing. 6. To install using Windows® OS, .NET Framework 4 is required. Compatible still image formats are PDF (created using Canon PDF Creator only), JPEG (Exif), TIFF, and PNG. Compatible video formats are MOV (from select Canon digital cameras only) and MP4 (from select Canon digital camcorders only). 7. Based on accelerated testing by Canon in dark storage under controlled temperature, humidity and gas conditions, simulating storage in an album with plastic sleeves. Canon cannot guarantee the longevity of prints; results may vary depending on printed image, drying time, display/storage conditions, and environmental factors. 8. 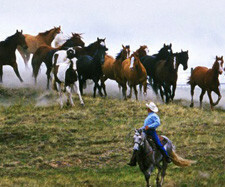 "Full HD Movie Print" is available from "MOV" movie files created by Canon digital cameras. From PC, or Mac with Intel® processor. Requires Canon ZoomBrowser EX 6.5 or later, or Canon ImageBrowser 6.5 or later. 9. For network users, Auto Scan Mode is available only when scanning at a computer using MP Navigator EX software and selecting the 1-click feature then "Save to PC". 10. Requires an Internet connection. 11. The Public Switched Telephone Network currently supports fax modem speeds of 28.8 Kbps or lower, depending on telephone line conditions. Sending and receiving fax machines need to conform to ITU-T v.34 guidelines. 12. Page count is based on ITU-T No.1 chart or Canon FAX Standard Chart No.1. 13. 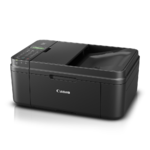 Requires Canon Easy-PhotoPrint for iPhone app, available for free on the App Store, Canon Easy-PhotoPrint for Android app available for free on Google Play, or Canon Easy-PhotoPrint for Windows RT available for free in the Windows Store. Compatible with iPhone 3G, 3GS, 4, 4S, 5, iPad, iPad mini, iPod touch, Android devices running Android OS 1.6 or later, and Windows RT devices. 14. Photo print speeds are based on the standard mode driver setting using photo test pattern(s) and select Canon Photo Paper. Print speed is measured as soon as first page begins to feed into printer and will vary depending on system configuration, interface, software, document complexity, print mode, types of paper used and page coverage. 15. "ISO/IEC 24734, 24735 define the default print and copy speed measurement methods. Print speeds are the averages of ESAT in Office Category Test for the default simplex mode, ISO/IEC 24734, excluding time to print the first set. Copy speed is the average of FCOT, ISO/IEC 24735 Annex D. ADF copy speed is the average of ESAT in General Performance Test for the default simplex mode, ISO/IEC 24735, excluding time to copy the first set. 16. Optical resolution is a measure of maximum hardware sampling resolution, based on ISO 14473 standard. 17. Black & white document fax transmission speed is based on default setting using ITU-T No.1 chart. 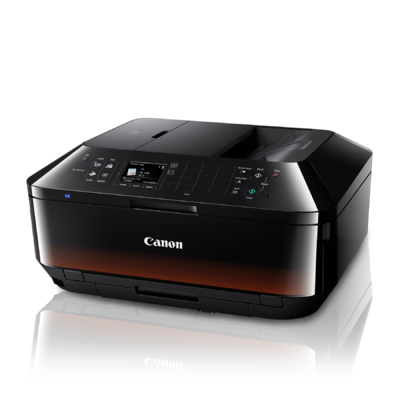 Colour document fax transmission speed is based on default setting using Canon Colour Fax Test Sheet. Actual transmission speed vary depending on document complexity, fax setting at receiving end, and line conditions etc. 18. Requires mobile phone (or other device) equipped with Bluetooth v2.0 technology and optional Canon Bluetooth Unit BU-30. Bluetooth operation depends on the device and software version used. Operating distance is approx. 10 meters but may vary due to obstacles, radio signals, locations where radio interference occurs, magnetic fields from microwave ovens, device sensitivity and/or antenna performance. 19. Print Your Days requires Microsoft Silverlight 5, an Internet connection and runs on Windows Internet Explorer 8, 9 and Google Chrome on a PC running Windows 7 or Windows Vista. Will also work in Firefox under Windows 7 (32-bit) and Windows Vista (32-bit). 20. System requirements vary by application. 21. Warranty programs are subject to certain conditions and restrictions.